Gas station, still in operation, sits on future site of Public Safety Center at Allen and Hall boulevards. The $400,000 also will pay for cleanup of a diesel spill on adjacent property back in 2006. Beaverton will receive $400,000 from the U.S. Environmental Protection Agency to clean up brownfields on the site of the city's future Public Safety Center. The cleanup of the Shell gasoline station at the southwest corner of Allen and Hall boulevards — a station still in operation — is one of the remaining tasks before the city can demolish the former Beaverton Activities Center. The money also will pay for cleanup of a diesel spill that occurred on adjoining property in 2006. Beaverton was one of three Oregon cities to receive such grants, which have totaled $48 million to Oregon communities in the past two decades. 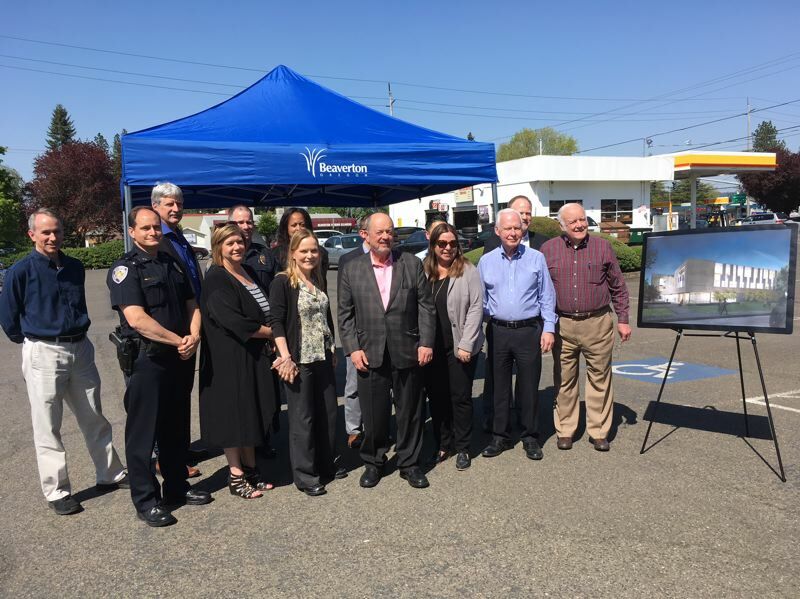 "This grant enables Beaverton to safely address longstanding environmental issues at and around the future home of the police department," Mayor Denny Doyle said at a brief onsite ceremony Thursday, April 26. Voters approved a $35 million bond issue in 2016 for the Public Safety Center, which will house police and emergency management in a building that can withstand a severe earthquake. The current building at 4755 S.W. Griffith Drive, the former City Hall, is not earthquake-resistant. The current Beaverton Activities Center building will be demolished this summer, and ground will be broken for the new building in early 2019, after it clears a city design review. It is scheduled for completion in 2020. Among those present was Chris Hladick, EPA regional administrator for the four Northwest states, based in Seattle. Before he was named to the EPA job last fall, Hladick was Alaska commissioner for commerce, community and economic development, and also city manager in three cities, including Unalaska. "Of all the projects I've done, I've never built a police station," Hladick said. "I also know how competitive it is to get grants." Beaverton benefited from a previous EPA grant for an assessment prior to cleanup. Brownfield cleanup grants have enabled Oregon communities to reuse a total of 1,500 acres at 125 sites, according to EPA officials. Doyle credited U.S. Rep. Suzanne Bonamici, a Democrat from Beaverton, with weighing in at a key moment before the EPA awarded the grants. "This critical support will help revitalize the Allen Boulevard corridor by increasing economic opportunities and preparing for the eventual construction of the Beaverton Public Safety Center," she said in a statement. "I was proud to advocate for the city to receive this funding and look forward to touring the Public Safety Center after it is completed." Also present were Ree Armitage, field representative for U.S. Sen. Ron Wyden, D-Ore., for Washington and Clackamas counties, and officials from the city and the Oregon Department of Environmental Quality.